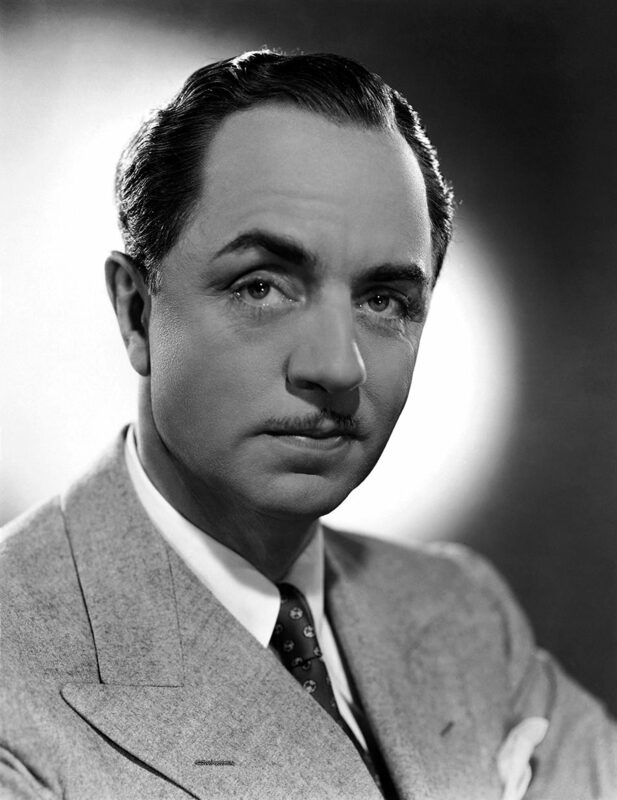 "Lux Radio: My Man Godfrey"
Whenever we see a picture of William Powell, it is difficult to imagine the man in any other get up than a shiny tuxedo. With his wavy dark hair and insouciant pencil-thin moustache, Powell epitomized American sophistication. Even in shots where Powell is relaxing outdoors or in a role as a Foreign Legionnaire (Beau Geste, 1926) or a wise old Navy Doctor (Mr. Roberts, 1955), he seems ready to slip into the tux like it was a second skin. Powell was born in Pittsburgh, but his family moved to Kansas City, Missouri, when he was a teenager. The Powells lived just blocks away from the childhood home of screen siren Jean Harlow, but the future stars did not meet until their Hollywood days. After high school, Powell studied at the American Academy of Dramatic Arts in New York. After working in stock companies, Vaudeville and briefly on Broadway, he landed a small role in John Barrymore’s silent Sherlock Holmes(1922). Although Powell had considerable success in silent pictures, his career really took off when MGM cast him as Nick Charles in The Thin Man (1934). 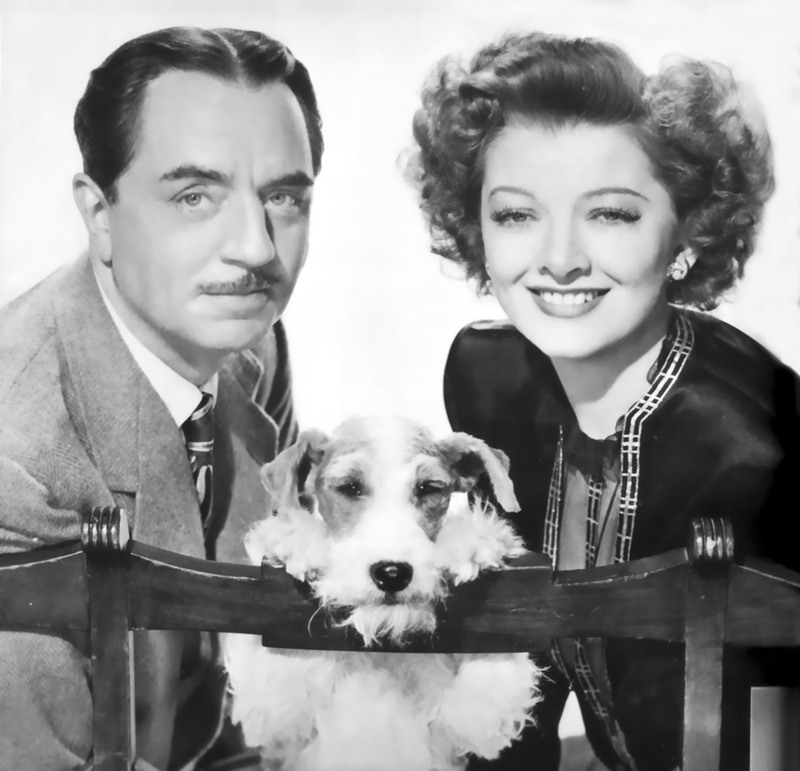 Although the picture is a delightful soft-boiled detective story, the real delight of the film is the chemistry between Myrna Loy and William Powell. Loy and Powell would appear in 14 films together, not limited to the Thin Man franchise. They reprised their roles for Lux Radio Theater, but in the Thin Man radio series Nick was played by a series of actors, including Les Damon and David Gothard. Powell was married to actress Carole Lombard in 1931 (his second marriage). The marriage only lasted two years, but the couple remained friends after their divorce, and appeared together in My Man Godfrey (1936). Lombard and Powell both received Academy awards for their roles. Powell was reportedly devastated when Carol Lombard became Hollywood’s first casualty of WWII (the actress was killed in a plane wreck while returning to her then husband Clark Gable after a War Bond Drive tour). In 1934, Powell met and fell in love with fellow MGM star Jean Harlow. Harlow was reportedly close friends with Powell’s screen partner Myrna Loy. The couple seemed fated to be together, having lived very near each other as teenagers. Personal differences (she wanted kids, he didn’t) and studio politics prevented them from marrying. While filming Harlow's last picture, Saratoga (1937) with Clark Gable, Loy noticed that her friend had taken on a grey complexion, was fatigued and gaining weight. Jean had a history of delaying films due to her illnesses, so there was not great concern at first. On May 27, 1937, Powell left the set of his own picture to drive Harlow home. When he went to check on her the next day, he saw that she had not improved, so called her doctor and her mother. Harlow was suffering from kidney failure, possibly related to a childhood case of scarlet fever. She passed away on June 7 at the age of 26. She was buried holding a single gardenia and a handwritten note from Powell which said “Goodnight my dearest darling”. Powell paid for the $25,000 room in the Great Mausoleum at Forest Lawn. Powell was diagnosed with cancer in 1937, but after undergoing surgery and an experimental radium treatment, the disease went into remission. His career slowed a great deal during the forties, although he was nominated for an Academy Award for his role in Life With Father (1947). He reprised the role for the 1950 radio series My Mother’s Husband, but only the audition episode was recorded. Powell’s last film role was in Mr. Roberts. He passed away in 1984 at the age of 91. A Star on the Hollywood Walk of Fame at 1636 Vine St honors William Powell’s contributions to Motion Pictures. Just simply one of the best. Without a Gable, Powell was King.